and what do I want besides your love and grace? my inheritance for eternity. Amen. His feast day is May 17. In Paschal's lifetime the Spanish empire in the New World was at the height of its power, though France and England were soon to reduce its influence. The 16th century has been called the Golden Age of the Church in Spain, for it gave birth to Ignatius of Loyola, Francis Xavier, Teresa of Avila, John of the Cross, Peter of Alcantara, Francis Solano and Salvator of Horta. Paschal's Spanish parents were poor and pious. Between the ages of seven and 24 he worked as a shepherd and began a life of mortification. He was able to pray on the job and was especially attentive to the church bell which rang at the Elevation during Mass. Paschal had a very honest streak in him. He once offered to pay owners of crops for any damage his animals caused! 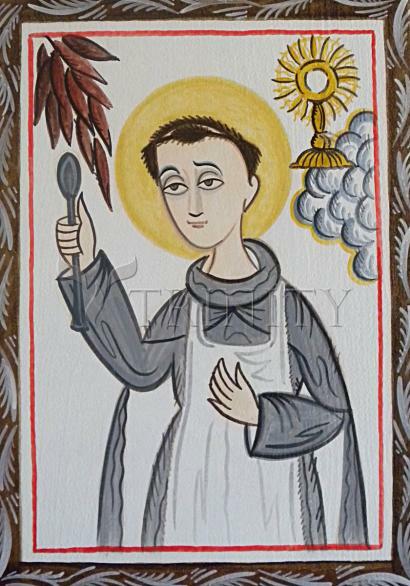 In 1564, Paschal joined the Friars Minor and gave himself wholeheartedly to a life of penance. Though he was urged to study for the priesthood, he chose to be a brother. At various times he served as porter, cook, gardener and official beggar. Paschal spent his spare moments praying before the Blessed Sacrament. In time many people sought his wise counsel. People flocked to his tomb immediately after his burial; miracles were reported promptly. Paschal was canonized in 1690 and was named patron of Eucharistic congresses and societies in 1897.